Can you identify anyone in this photograph? 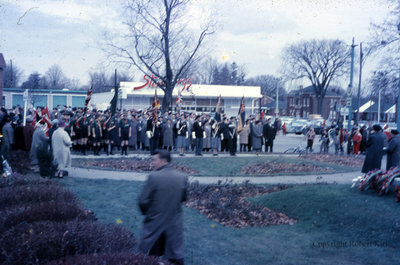 A colour photograph of the Remembrance Day ceremony at the Cenotaph in Whitby. The photograph was taken facing Dundas Street East. The sign for Steinberg's (a grocery store chain) can be seen in the background. The Cenotaph was erected at the southwest corner of Dundas Street and Green Street and was unveiled by Colonel Henry Cockshutt, Ontario's Lieutenant-Governor, on June 3, 1924. Remembrance Day, c.1968, Robert Kirk. Whitby Archives D2013_011_016.